Supreme Air provides Air Conditioning, Heating and Plumbing Services, Repair, Installation, Maintenance, and Tune Up in North Potomac, MD and surrounding areas. Colin was extremely professional and knowledgeable. Located the issue promptly and advised on how to proceed with work. Completed project as described. Very pleasant experience from start to finish. Upon arrival I was told that geo unit in addition wasnâ€™t heating. Found unit locked out on water flow. Put gauges on system and ran heat, found system is low in 410a. When removing suction side cap I found schrader pin is where leak is located. Repaired pin and checked for other leaks, none found. Spoke to customer and he approved repair. Added 410a to system and balanced Superheat and subcool. Measured delta air temps and delta loop pressures and temps. Unit operating normal. Customer also asked me to replace filters for console unit. Found filters in back storage of main garage but customer didnâ€™t have both sizes of filter. Could only replace filter in laundry room garage console unit. I reset the thermostats to default heat stage setting of .5,.5,.5. Both ground loops haves cold temperatures and are not heating as well as could be because they have been running constantly. Unit #1 and #2 are operating normal. 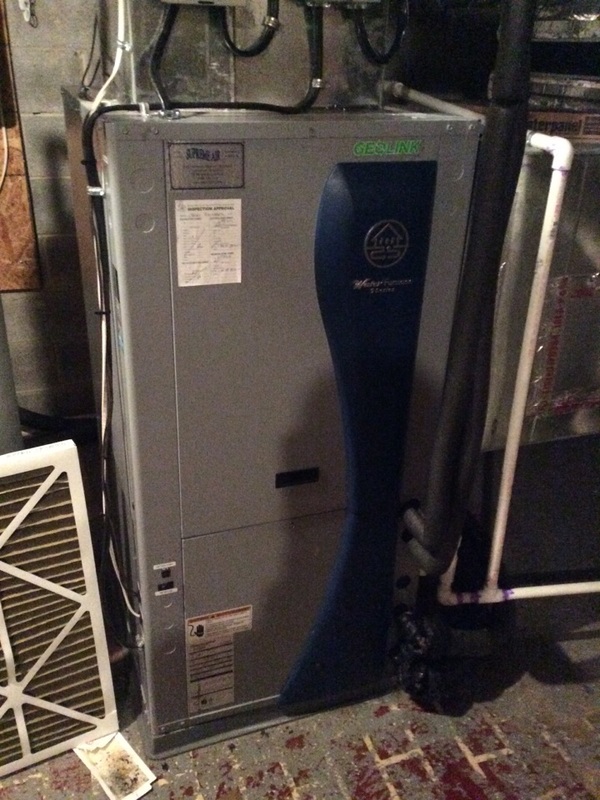 Unit #3 has back up heat staging but does not work because they ran a 5 wire thermostat wire from the air handler to the thermostat. There is not enough wires to make it work. I quoted a repair to fish 8 wire through but it hit something in the wall and I had to stop and connect it back the way it was. I showed the customer and recommended Honeywell wireless thermostat with equipment interface. I will send a quote and customer will speak with there partner about it. I checked the electrical wiring and electrical systems, all are within specification. Flow rates are set correctly. Loop pressures are adequate. On arrival we found defective control board on unit #3 main house basement. We created an stimate and customer agreed to replace defective board. After replacing defective part unit started operating normal. Repaired refrigerant leak at wall penetration leading to Attic. Ryan helped hold ladder and torch while brazing new elbow and piping. Pressurized to 300psi nitrogen and held while we clamped lineset back to wall. Pressure held. Vacuumed system down then added refrigerant. Balanced refrigerant using charging chart. Unit is operating normal at this time. Upon arrival I found Carrier HeatPump was locked out on low pressure fault. Found thermostat had recorded several low pressure faults. I can see evidence of oil on both refrigerant lines coming from attic to outdoor unit on the lineset outside running down house. Went to AHU in attic and found no leaks inside. Set up extension ladder and removed thumb gum sealing penetration to find leak is inside of wall. Quoting customer for leak search and repair but need 2 guys to make repair. Repair will require us to braze lineset on extension ladder. Need someone to held hold ladder, torch, and extra piping while repairing line. Customer approved repair but we need to return with 2 guys, 3/8copper pipe, (2) 3/8 couplings, and (2) 3/8 90s. Office please call to schedule return.